Now that the S&P 500 is down 2.35% just two trading days into the year, the US equity market is off to its worst two-day start since 2000. It is also just the sixth time in the index’s history that it has seen a decline of 2% or more in the first two trading days of the year. In other words, it’s not often that it gets worse than this! Look on the bright side, though, we could only be down 1.35%! What are we talking about? 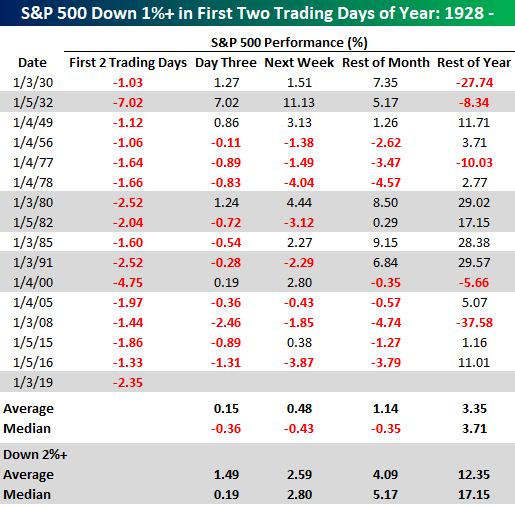 The table below lists every year since 1928 where the S&P 500 was down 1% or more YTD two trading days into the year. For each year, we also show the S&P 500’s performance over the following day, week, the rest of January, and the rest of the year. At the bottom of the table, we list the S&P 500’s average return for all of the dates listed as well as just the shaded years where the S&P 500 was down more than 2%. Obviously, it’s a small sample size, and we wouldn’t put a ton of weight into the results, but the average and median returns following years where the S&P 500 started the year down 1%+ are considerably less than the returns following years where the index kicked off the year with a decline of more than 2%.